"Part of the essence of pop music is that you're not trying to create something that is so totally original," says Bones Howe. "If you do that, then you end up leaving people behind. There has to be some connection to your audience, and my connection to my audience was always me. I was always my best audience." Indeed he was. 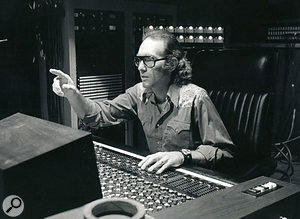 During an illustrious career that spanned five decades, Howe brought a significant degree of musical insight and technological innovation to records by, among others, Elvis Presley, Tom Waits, the Turtles, the Mamas and the Papas, Frank Sinatra, Johnny Rivers, the Association and the Fifth Dimension, as well as the soundtracks of films such as La Bamba, One From The Heart and Back To The Future. In the process he earned more than 20 gold and platinum discs, a slew of Grammy nominations and a couple of Grammy Awards, illustrating that, while he was his own best audience, the critics and the punters ran him a close second. Born in Minneapolis, Minnesota, in 1933, Dayton Howe moved to Sarasota, Florida, at the age of eight and picked up the 'Bones' nickname as a skinny teen while indulging his love for jazz and teaching himself to play drums. After gigging with both a quintet and a dance outfit, he then played with numerous bands around the Atlanta area when studying electronics and communications at Georgia Tech. Several of the road musicians who passed through town urged Bones to relocate to the West Coast, and when he learned that many studio techs there were old-time radio engineers who knew next to nothing about music, he took the advice and, upon graduation in 1956, landed a job at Radio Recorders in Hollywood. Familiarising himself with the intricacies of tape editing and even stereo recording at a time when neither were industry standards, Howe soon became recognised for his expertise and understanding on both sides of the control room glass, and during the latter part of the 1950s he mixed records by, among others, Elvis, Pat Boone and BB King. Five years at Radio Recorders were followed by an 18-month stint at Bill Putnam's United-Western facility, before Howe took the bold and highly ambitious step of becoming the industry's first independent engineer. That was in 1962, and three years later he was producing as well. In 1968, working alongside director and business partner Steve Binder, Bones Howe served as co-producer and music producer of the legendary Elvis 'Comeback' special on NBC TV. Nevertheless, probably his career apotheosis was the Fifth Dimension's 'Aquarius/Let The Sunshine In', which sold three million copies and topped the Billboard singles chart for six weeks following its release on March 8, 1969, before scooping the Grammys for Record of the Year and Best Contemporary Vocal Performance by a Group. Blending smooth yet powerful harmonies with soul sensibilities, a sweeping orchestral arrangement and lyrics heralding universal peace and love, this medley was the perfect embodiment of the 'flower power' spirit. Its creation makes for quite a convoluted story. "My involvement with the Fifth Dimension came about during a period when I was doing several different things at once," Howe recalls. 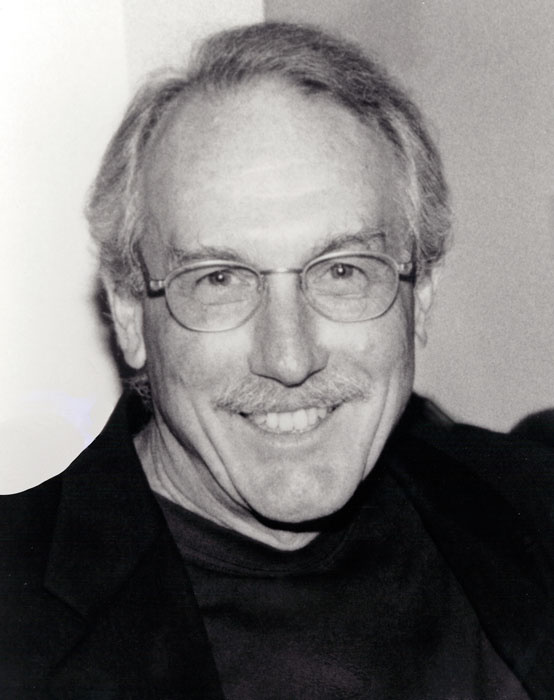 "I was playing drums on the Grass Roots records, engineering the Mamas and the Papas and Johnny Rivers for [producer] Lou Adler, doing the same for Snuff Garrett with Gary Lewis and the Playboys, and producing the Turtles. The Mamas and the Papas' recording of 'Go Where You Wanna Go' was intended as a single, but then at the last minute they came up with 'California Dreamin',' so Johnny Rivers, who had heard their record when Lou played it to him in the studio, decided to have 'Go Where You Wanna Go' recorded by a group of five black singers named the Versatiles. They were on Johnny's own Soul City Records label, and after he'd failed to have a hit with them he had this idea that maybe they could be the black Mamas and Papas. "So, he called me and asked me to record them, and he also said 'I need you to tell me all of the people who played on the Mamas and the Papas record.' Those sessions for their first album had only been a couple of months before, so I told him the people were Hal Blaine on drums, Joe Osborn on bass, Larry Knechtel on keyboards, Tommy Tedesco on guitar — basically, this was the first incarnation of Phil Spector's Wrecking Crew. "As a drummer myself, I always loved the feel of the way that Hal played. He played rock & roll with authority. Some people have that feel and some people don't, and no matter how precise they are and how good their technique is, they just don't have that feel for the music. Well, Hal always had this great feel for the music. OK, so he played a little loud and he pushed the time a little bit — whatever. It was his style, and his style worked for the kind of music that he played. I never thought he was much of a jazz drummer, quite frankly — I heard him play a couple of times and I didn't think he knew how to lock in with the rhythm section, but with rock & roll he was just wonderful. The fills that he played were fantastic, and he wasn't afraid to try things. He would ask me 'What do I do in these two bars?' and I'd always say 'I want you to make me see stars.' And he would do that. "With those guys it was about what ended up on the tape. Joe Osborn was a bass player who sat on the time. He didn't play anything fancy, he would just play the time, and that let Hal loose to go wherever he wanted to go, because he knew Joe would always be there when he got back. Joe was like the metronome in the band, but those guys all had great timing. I mean, Larry played electric bass around town for several years, so when he and Joe were together you could set your watch to them. And that just left Hal free to do whatever he wanted to do. With his great feel he would get up on top of the time, and that's where you got that tension. "For me it was always about the feel. I'd played as part of some rhythm sections, I bought lots and lots of records before I made any records, and as an engineer I sat behind the console and listened to all these different configurations of rhythm sections and string sections and so on. Well, talk about opinionated — by the time I came out the other end I already knew the people who I wanted to work with. By name. I knew who the people were going to be, even though it wan't carved in stone because there were always new people coming up." Meanwhile, transmogrified from the Versatiles into the Fifth Dimension by Johnny Rivers, the quintet of Billy Davis, Jr., Marilyn McCoo, Lamonte McLemore, Ron Townson and Florence LaRue enjoyed a top 20 hit in early 1967 with their straightforward cover of 'Go Where You Wanna Go', courtesy of a fun-in-the-sun production that incorporated Rene DeKnight's soaring string arrangement. Nevertheless, while this helped establish the group, there was a general assumption that said group were yet another white folk rock outfit, a view solidified by their recording of 'Another Day, Another Heartache' just a few months later. But then 'Up Up And Away', written by Jimmy Webb, climbed to number seven in the charts in the summer of '67, won five Grammys, and served as the title of a gold-selling debut album, produced by Johnny Rivers and engineered by Howe. 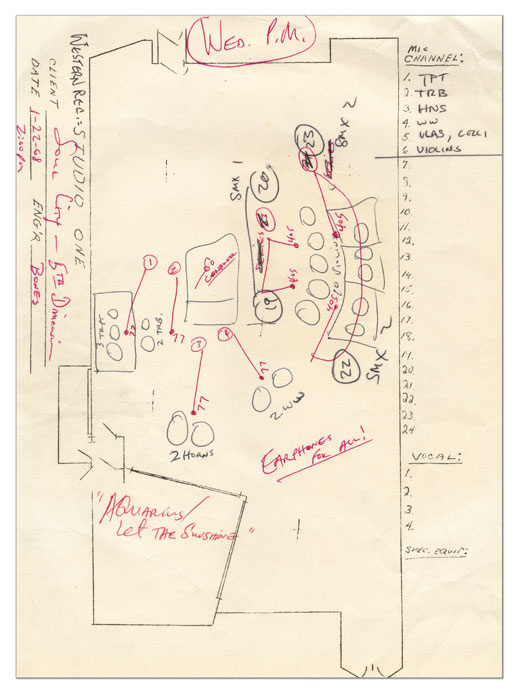 Bones Howe's original layout notes for the tracking session at Wally Heider Studio 3.Photo: Bones Howe"At that time, Billy Davis, Jr., was really the lead singer of the group," he says. "Everyone else performed group vocals, and it was pretty much understood that Billy would take care of the solo on any strong song. They all learned their parts by rote — in other words, somebody would work with them and teach each one his or her part like it was a melody. Jimmy Webb took care of that job on the first two albums and Bob Alcivar did the same on the third, because none of them read music, and they'd work on their respective parts four bars at a time until they learned them. In the studio, we'd always record them four bars at a time or two bars at a time — we'd get whatever we could and then we'd go on. There were very few occasions in the beginning when they'd sing a vocal all the way through." While the Fifth Dimension's two subsequent Howe-produced albums, The Magic Garden (1967) and Stoned Soul Picnic (1968), spawned further hit singles, including the latter's Laura Nyro-penned R&B title cut which climbed to number three, Bones enjoyed chart-topping success with the Association's 'Windy' and 'Never My Love' and helped revive Elvis's career with the aforementioned TV special. He was therefore on a roll and at the top of his game by the time 'Aquarius' entered the picture. "Beforehand, I listened to the cast album, and I thought 'This isn't a complete song. It's an introduction.' There was so much talk about that show at the time because people were naked on stage, and 'Aquarius' was just part of the opening routine. Well, I went to see the show, and about four-fifths of the way through there was a song called 'The Flesh Failures', which was a typical '60s downer — you know, the world is falling apart, we're all killing each other with poison, and so on. A total environmental downer. But at the end of the song there were three bars just repeating 'Let the sunshine in, let the sunshine in, the sunshine in,' over and over and over again." "He said 'Well, several people have also recorded "The Flesh Failures"...' and I said, 'No, I don't want the song. I just want the chorus at the end: "Let the sunshine in, let the sunshine in..."' So he said 'Well, let me ask them and I'll call you back.' I said 'Fine,' and the next day I went into the studio with the Fifth Dimension to cut some vocals and I got a call back from the publisher. He said 'I've spoken to all three of them and it's fine with them. If this makes you want to cut this song, you can pretty much do it any way you want to.' Years later, I found out that this guy was doing interviews, saying it was his idea to put these two songs together. What's that saying about 'Success has many fathers, but failure is an orphan?'" Bones Howe's decision to merge the mid-tempo pop tune 'Aquarius' with the gospel-flavoured refrain 'Let The Sunshine In' was one very much in tune with the era — he almost certainly wouldn't have conceived such an idea just a few years earlier. "As I got more and more experience as a producer, I trusted my gut more and more," he said. "I was on firm ground in the studio, having already spent a dozen years in that environment, and if something hits you in the face, you have to do it. Then you must have the confidence to know you're doing the right thing. And it was always about the music for me. If something bowled me over musically, I'd go with it. So, in the case of 'Aquarius/Let The Sunshine In' I told Bob Alcivar 'Don't worry about this. The girls are going to sing their part — "When the moon is in the Seventh House..." — and they'll love it, and then we'll have "Let the sunshine in, let the sunshine," at the end and it'll be great. Don't worry about how we're gonna get it together.'" There was, however, an immediate stumbling block when Alcivar discovered they couldn't sing the two songs in the same key. "Bob, don't worry about it," Howe reassured him. "We'll just do a modulation." "Yeah," came the reply, "But if I arrange 'Aquarius' in the key that's right for the girls, then I've got to take it down a whole fifth in order for it to work with everybody singing together on 'let the sunshine in'." "Bob, this is music," said Howe, as if Alcivar needed reminding. "What's wrong with inverting back up a fourth? If you do that, you'll be in the same key as if you go down a fifth. Look, do this: find a key that fits both parts of the song, that shows off their voices the very best we can, and then find a way to invert it up and don't worry about how the keys relate to each other. If it comes to that, I'll jam them together like two trains." "By that time, Bob Alcivar was not only the Fifth Dimension's vocal arranger, but he was also picking keys and writing out the lead sheets," Howe explains. "I said 'Bob, what do we need an arranger for? We don't need someone to write the tracks. You and I will write the tracks.' I would provide him with the form and shape, describing the verse-chorus structure and where I wanted the breaks — the arrangements were very open. There were just chord sheets, and only occasionally would there be a written part that we'd want a pianist or guitarist to play. Most of the time they were left wide open, and I'd work on the arrangement with the guys in the studio — all they needed to know was what the chord changes were, as well as the rhythm and the tempo. "That's what we did, and I jammed them together like two trains, exactly as I said I would. I just made an edit — bang! — editing from one set of eighth notes to the other set of eighth notes, and we went into 'Let The Sunshine In' and nobody cared that it was in a completely different key. For me it was a case of 'OK, you've made this bed and now you've got to sleep in it. 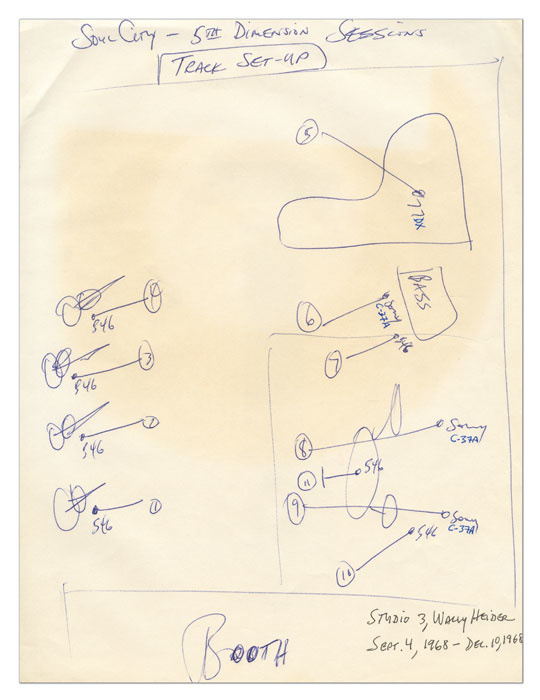 You figure it out and make it work.'" The Fifth Dimension toured virtually non-stop following the completion and 1968 release of the Stoned Soul Picnic album. So, if Bones Howe and Bob Alcivar worked with the band members on new material, this was whenever they returned to LA for a few days' break. And while the singers commenced an engagement opening for Frank Sinatra at Caesar's Palace in Las Vegas, the backing track was committed to eight-track tape on the 3M machine in Howe's favoured Studio 3 at Wally Heider Recording in Los Angeles. 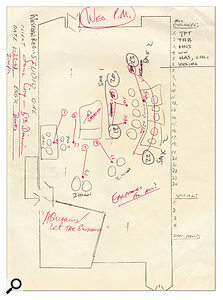 There, inside the compact, long and narrow live area — an almost exact duplicate of Bill Putnam's Studio 3 at United-Western, although it was slightly longer — the aforementioned Wrecking Crew rhythm section of Hal Blaine, Joe Osborn, Larry Knechtel and Tommy Tedesco was augmented by guitarist Dennis Budimir, while Bones Howe spent a good part of his time behind the control room's API console, monitoring with Altec 604s. Bones Howe today.Photo: Bones HoweThrough the window, he could see the guitarists sitting with their backs facing the left wall, while the drummer, bass player and pianist sat against the right wall. "They could take two paces and touch the person facing them," Howe says. "People often ask me 'How did you isolate the drums to get that sound?' and I've explained that the first thing they've got to understand is that the musicians were in a room where they had to watch out they didn't bump into each other when they got up for a break. It was a tiny room and all the mics were open. That meant you had to know the microphones you were using, because the entire sound from every instrument went into every mic. The sound was therefore down to the room that we were using, the instruments that we had and the way that we miked them. There was no isolation, there weren't even any baffles." The guitars, on track 1, were invariably miked with Electro-voice 666s; the piano was on track 2; the drums, recorded mono to track 5, had Sony C64s as overheads and Shure 546s on the snare, kick and hi-hat; and the bass, on track 7, went through an amp that was also miked with a 546. 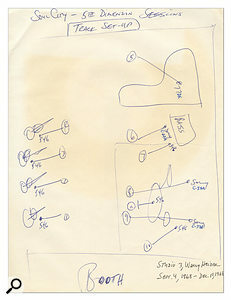 The vocals were destined for tracks 3 and 4, while tracks 6 and 8 were reserved for string and percussion overdubs. "The overheads were condenser mics, and the others were dynamic," Howe says. "They were all what you would call inferior microphones, bottom-of-the-list kind of stuff, but the 666s and 546s were what everbody used on stage in those days. You could hammer nails with them. At the same time, there were no more than 12 inputs on the API console, so we had to bring things in and make decisions about what we were going to mic. It was contemporary for its time, yet this kind of equipment is now a collector's item." The vocal sessions took place in Vegas, at the Putnam-built United Recording of Nevada, with the group members standing in a semi-circle as if they were onstage, gathered around a pair of RCA DX77 microphones that were positioned back to back, with the 'boys' on one side (track 4) and 'girls' on the other (track 5). "They were the only vocal mics I used back then," Howe remarks, "and that was the same format I used for the Mamas and the Papas. Solo parts were done separately on a 77 using the 'V1' setting — 'M' was the music setting, 'V2' had a high low-end cutoff which made it ideal for radio announcing, and 'V1' provided way more low end and made it what I've always thought was the best microphone for the human voice. It got all of the music and none of the mouth noise or tongue noise, and I ran that through a [Urei] 1176 that was absolutely the best limiter for vocals: threshold/attack at 6, release at 7, and a 12:1 compression ratio. "United Recording of Nevada was that horrid studio where you had to stop recording when the train went by, but that's where we did the vocals. The group members were working late every night, so I got four hours with them each afternoon. That meant I lived in Vegas for a month, which was like living in Vegas for a year — there was nothing to do. 'Aquarius' featured the girls singing together, and a lot of those parts were drop-ins, but when I did solo parts I would always run the track, give them a separate track to work with and then use the parts that I thought were really the best. This didn't interrupt the flow — I mean, I wasn't cutting word by word. I would use phrases, and bits and pieces, and give them their best shot." "I said 'Jimmy, this record's gonna be five and a half, six, seven minutes long.' He said 'I don't care how long it is. It's a number one record,' to which I said 'Well, Jimmy, I cut them all like they're hits and then the record company makes its decision afterwards.' However, that really stuck with me. When you have to grind through all the pieces of putting something like that together, you've heard it so many times that you don't know if the excitement you feel is due to the music or the relief of having got it over and done with. And so when somebody who'd never heard it before walked in off the street and stood there with his mouth open — especially somebody who I liked and whose opinion I respected — this convinced me that the record was at least worth listening to." 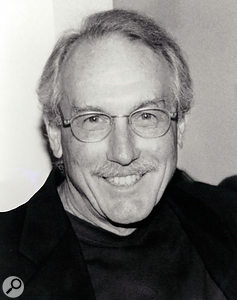 With the vocals for 'Aquarius/Let The Sunshine In' recorded, Bones Howe set about tracking the same for the rest of the numbers on what would come to be the Age Of Aquarius album, a long player that would include another chart-topping single in the form of Laura Nyro's 'Wedding Bell Blues'. Four hours each afternoon were spent in the studio with the Fifth Dimension, and after one such session he returned to Caesar's Palace and was struck by a bolt of inspiration. "Bill got the album, and I must say that if you listen to the two records side by side there is a similarity between the intros of 'Lost In The Stars' and 'Aquarius', even though the concept is different. Don Costa's arrangement has strings and woodwind swirling like some motion picture score, whereas Bill's and mine has 'gung gung-gung' running underneath it... As I said before, if something hits you in the face and you know what it is, you've got to use it, and this struck me as being right and I knew it would work. "I returned to LA and we laid these parts down with a full orchestra — there were eight brass, three or four woodwinds and a whole string section. By that time I was hot stuff in Hollywood. I could call the musicians up and it wasn't all that expensive to round up an orchestra in those days. We were in the big studio at Heider's, and as usual I did group miking. I believe that you should record an orchestra like an orchestra's meant to be recorded, and that's one reason why I did them separately from the rhythm section. It's really hard to track an orchestra with a rhythm section banging away in the room, so I recorded them on a separate track. And everything was in the room at the same time, because I really felt it had to have that concert sound. You know, if there's some leakage from the brass, that's still OK."
AKG 405s were utilised for the strings, RCA DX77s for the horns. And while these were again recorded in two sections, they weren't cut together until after Bones Howe had mixed them separately. "Of course, when the guys laid the strings down, they heard the rhythm part from the count-off," he says. "They heard 'gung gung-gung' but when I mixed it I didn't bring the rhythm in until after the strings had already started and gone through the first four or five bars. Then I began sneaking that in. So, it starts with the flutes going 'doo doo dee doo' and the strings going 'na na na na', and then underneath you begin to hear 'gung gung-gung, gung gung-gung' and it gets louder and louder, again reaching its peak when the girls come in, singing 'When the moon...' It was like editing a movie production." Following the addition of an orchestral introduction (see box above) and mix to two-track, Bones Howe was convinced that 'Aquarius/Let The Sunshine In' was a great piece. Yet, in spite of this and Jimmy Webb's ringing endorsement, he still wasn't sold on the track's viability as a radio-friendly single, not least because it clocked in at 4'49". The promotion man at the label thought differently. "'We've got to put it out,' he insisted. 'We're going to make some test pressings and send the record out to a couple of radio stations.'" "Whatever," figured its producer/engineer. Then, one night, while having dinner with Melodie at Martoni's restaurant across the road from Wally Heider Recording, he ran into good friend Bill Drake, the programming director for Drake-Chennault radio stations such as KHJ and KFRC, which were then the key pop sources right across America. "He said 'You know a lot about radio. Well, just think about that guy who's sitting there, he's in a music sweep, he's got two-and-a-half, three minutes until he comes straight up on the hour, and he's saying to himself "What am I going to play going into the next hour?"' I said 'Say no more!' I finished dinner, I went back to the studio and stopped what I was doing, and I made three different versions. I made a short version, a medium version and a long version, and I took them into the record company the next day and told them about my meeting with Drake the previous night. The result was that we mastered a single that day, with the long version on one side and the short 2'59" version on the other — the medium version really didn't make much sense. "The long version had two verses and two choruses, and I took a verse and a chorus out of the first part of the record, going from the end of the first verse to the end of the second chorus. Then I went into the 'gung-gung-gung-gung-gung' and left the entire 'Let The Sunshine In' part intact. And Drake was absolutely right. The song went to number one and it was the short version that got played, although DJs also played the other side." Having worked with Phil Spector a couple of years earlier, Bones Howe appeared to be taking a leaf out of his book when he crafted much of his and the Fifth Dimension's biggest hit from top to bottom. It was, essentially, his own baby, conceived and nurtured to the point of fruition. "I always said I made disguised jazz records," he remarks. "They contained harmonic things that you don't normally hear in pop music, and that's why 'Aquarius/Let The Sunshine In' was not your straight-ahead hit. It didn't have the one-three-five string arrangement. It was meant to sound full and fat. And you also have to think back to the times — you had Blood, Sweat & Tears, but even that was bordering on jazz. "The funny thing was, after 'Aquarius' was a hit I got all this heat and the guys in promotion said to me '"Wedding Bell Blues" will be a big record.' Al Bennett was the head of Liberty Records in those days, Soul City was a part of Liberty Records, and when they played the record for him he said 'No way that's a hit. No way.' He prided himself on his judgement, because I guess he'd picked a few hits in his time, and when the record went to number one the guys in the promotion department gave him a plaque with a tin ear on it."